It’s like doodling with purpose. What if taking notes could put a smile on your students’ faces? Just imagine if you could get your kids excited about an exercise in higher-order thinking. Picture your students begging to take notes because it involves gel pens and doodles. Enter, sketchnotes in the classroom. The sketchnotes phenomenon is the brainchild of designer Mike Rohde, and it is rapidly spreading beyond the design world. Now we’re seeing sketchnotes in the classroom on a regular basis. For instance, a student might use it to process information visually, use bold lettering for key points, making containers or boxes for special points—the list can go on and on. Basically, you can use it for anything that makes the information pop off the page and stick to the brain. Here are 10 examples from Instagram with ideas of how you can use sketchnotes in the classroom. Give it a try. You’ll see a whole new level of engagement if you assign students to take sketchnotes when you have a guest speaker or your class attends an event. 2. Sketch a personal experience. Invite students to sketchnote personal experiences prior to writing about them or discussing them in class. When approaching a difficult learning concept, doodle it yourself on the board as you talk students through it. Then invite them to process it in their own way in their own sketchnotes. Sketchnotes can be any size, so invite your students to cover your whiteboards with everything they’ve learned in a unit as a form of pre-assessment review. Then let them walk around and study the gallery of learning. This professor has used sketchnotes to organize her own thoughts before a lecture, and you could do the same by sharing the idea with your students before they give oral presentations. This could relate to many lessons and classroom ideas. Invite students to do research sketchnotes before writing a paper or creating a video. 7. Sketch with a different focus. 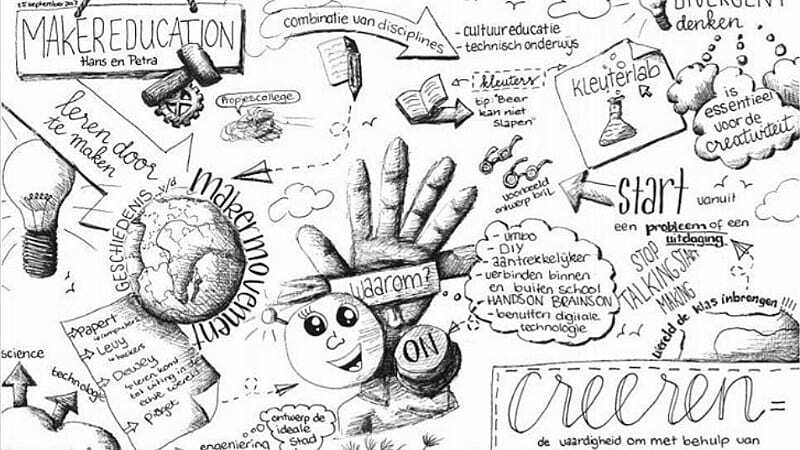 #sketchnotes van het laatste college ? You can help students explore a variety of tools by asking them to focus on sketches, symbols, containers or unique text. This example shows just how much someone can convey visually through drawn elements. Students can do sketchnotes on text, taking note of the main ideas and essential quotations before writing a paper or doing a project on it. This teacher simply explored meaning with color. Do something similar by having your students create performance posters, book displays, bulletin boards, or event programs. As students get more comfortable in the medium, you can show them more and more complex examples to inspire them to improve. This creative person skillfully mixes and matches all the layers of visual meaning with her words, incorporating symbols, connecters, containers, sketches, and varied forms of text. Introduce students to sketchnotes with one of these activities and see what happens. You just might be surprised by what they come up with. Have you tried using sketchnotes in the classroom? How did it go? We’d love to hear in the comments. I love to help high school English teachers innovate. Check out The Spark Creativity Teacher Podcast on iTunes for creative teaching strategies delivered on the go, or get my popular pack of free one-pager templates with complete instructions at http://bit.ly/onepagersuccess.